Four years in the making, Norway's Triosphere returns with their third album, The Heart of the Matter. It was worth the wait. While reviewed previously on this site by another reviewer, this is my first experience with the band. There's many things to like about Triosphere. Not the least of which, for a female-fronted band, is that vocalist and bassist Ida Haukland is a pure melodic metal singer, not swaying to the extremes of operatic or death vocals. Another significant element is simply their superb sense of songwriting. They have an arsenal of weapons to draw from whether an abundance of catchy riffs, a strong melody, vocal harmony, notable rock groove, or sizzling leads. I think, more than anything, the guitar structure, riffs and leads, are rather immense and attractive, propelling the album. You can't avoid the swell of riffs and leads within songs such as Steal Away The Light or As I Call, melodic and inspiring. But Triosphere wraps all these elements up in imaginative and entertaining arrangements, nearing progressive metal, that make for essential melodic metal listening. While the entire album is a rich tapestry of melodic metal, a few songs deserve some attention thanks to some interesting passages within. One is Breathless, a steady sturdy number that has this interesting breakdown after the half way point. The riffs collapse for this light guitar work, almost fusion, over equally slight drums. Another terrific song follows in Departure. It has its share of riffs and some staccato drums, but once more, it's the latter guitar segue that grabs you. More emotive and lighter leads over subtle bass and drums. A third song of interest is the later Remedy with a smooth melody and enormous vocal harmony. But the kicker, once more, is the guitar breakdown in the latter half. Different than the previous songs, it's sharper and heavier, riff based yet fiery, and propelled by some intricate drumming. Finally, the entire swail of riffage is abandoned at the end of the album for the acoustic and gentle ballad Virgin Ground. A respite perhaps? All in all, Triosphere, with The Heart of the Matter, has turned out a rather terrific and enjoyable album of melodic heavy metal. Easily recommended. 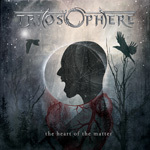 Four years in the making, with The Heart of the Matter Triosphere has crafted another intriguing and entertaining album of melodic heavy and power metal. Easily recommended.